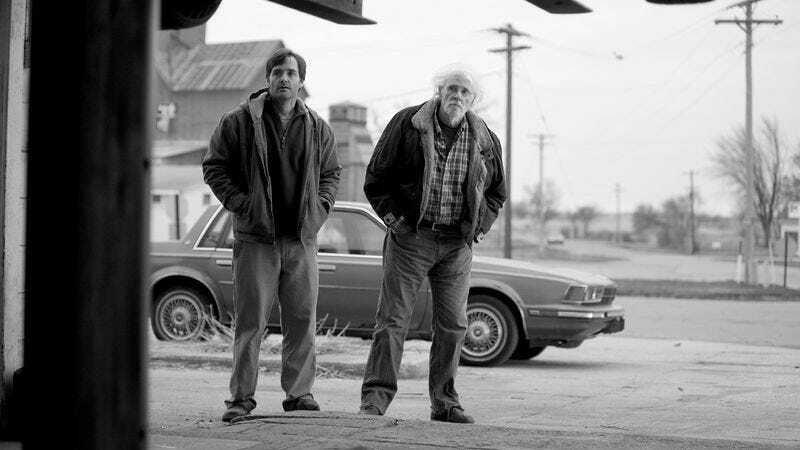 Plenty of artists have a love-hate relationship with where they grew up, but it takes a truly conflicted soul to make a movie like Nebraska, which seems at once to lament the demise of a way of life and say “good riddance” to those practicing it. For Alexander Payne, the film is a homecoming: After visits to California wine country and Hawaii, the Omaha-born director is back on native soil, the setting of his first three pictures and a place he’s generally treated with the same disdain that suburban-raised filmmakers reserve for white picket fences and chain restaurants. Nebraska has been shot in milky black and white, which makes it resemble one of those Time Life photographs of a crumbling, forgotten America. But besides its main characters—a father (Bruce Dern), teetering on the edge of senility, and his patient, concerned son (Will Forte)—the actual people populating this rural wasteland are so grotesquely buffoonish, so designed for ridicule, that it’s hard to take the melancholy seriously. Payne, who never met pathos he didn’t feel inclined to puncture with slapstick humor, has somehow made his best drama and his worst comedy rolled into one. So plainly does Nebraska adhere to the Payne formula, a merging of high- and lowbrow sensibilities, that it’s surprising to learn he didn’t actually pen the screenplay. (That credit goes to TV writer Bob Nelson.) Like most of the director’s work, it’s a road movie: Fooled by one of those “you may have already won” mail scams, elderly drunk Woody (Dern) badgers his youngest son, David (Forte), into driving him from Billings, Montana to Lincoln, Nebraska, to collect the million dollars he’s been promised. David knows the contest is a sham, but agrees to the trip anyway—ostensibly to shut the old man up, but really because he’s eager to spend a little time with the father he wished he knew better. For a while, as the two make their way southeast, Nebraska works surprisingly well as a bittersweet twofer. Dern, that veteran of American cinema, disappears completely into his role. He nails the distant, cantankerous spirit of his character—a man who’s not quite there, even as he’s locked in conversation. It’s when Nebraska veers off the road, and into the one-horse town David grew up in, that condescending comedy begins to take precedence. Suddenly, the film is invaded by an army of yokel locals and money-grubbing family members, all looking for a piece of Woody’s “winnings.” Payne wallows in this hick sideshow: There’s a long shot of the extended family gawking like lobotomy patients at a sports game, while another scene set in a supremely tacky restaurant/karaoke bar finds Stacy Keach—as an old, bullying business partner—warbling out a painful rendition of “In The Ghetto.” Later, Woody’s wife (June Squibb, who also played the wife in About Schmidt) shows up to brusquely complain about “sluts” and flash her business at a tombstone. These moments are a new low for Payne—the scorn and patronizing pity of his wretched Paris Je T’aime segment, this time heaped upon the entire population of a town. The straight man in all this, Forte admirably forgoes any trace of SNL goofiness, but he still seems a little out of his league. Not that the movie gives him much to do but sigh and roll his eyes: David is less a character than a surrogate—a vessel through which the audience, and Payne himself, can feel embarrassed by and superior to these hopeless rubes. Nebraska comes to life whenever it puts Woody and David alone in the frame, and it rallies for the most cornball-effective ending Payne has ever staged. (Those with father issues will surely lose their composure here.) But as an ode to fading small towns, and to the state its director once called home, it feels downright disingenuous. Put another way: If Nebraska is a eulogy, it’s the kind Squibb’s character “delivers” at that grave, skirt up and respect absent.